I’ve been a passionate traveler all my life. Living in remote New Zealand meant quickly figuring out a way to fly very long-distances and land with elegance and energy. I consulted with doctors and frequent-flier friends, and after many flights around the world to India, Russia, Paris, Rio, Athens and Venice, Majorca, and every corner of the globe, I’ve figured out my jet-lag prevention plan. The concept is to regard a plane (private or commercial) as a sleeping compartment for any flight over four hours. You get on the plane, get calm and comfortable, and you sleep, day or overnight. But there are rules to follow and preparations to make. Regard flight time as prep time for your destination—and you’ll arrive at 7am in Paris or at noon in Venice ready to have a quick shower, perhaps a massage, a delicious breakfast at the Gritti, and then to head straight to the Louvre, to the Palazzo Fortuny, or to Hermes and Lanvin. When making your reservation—no matter which cabin—reserve a window seat as far forward as possible. Use the seating chart to make a smart decision. Put together a permanent in-flight kit of a small pillow (mine is by Frette), along with a wool or cashmere throw that will keep you warm from chin to toes (nice, even if the airline provides a duvet). Add warm socks and a soft well-fitting eye-mask. I always save copies of The New Yorker for ideal in-flight reading. Wear light layers of chic, comfortable clothes that you can sleep in. Your sleep kit will also include the best earplugs (noise reduction of 33 decibels or more, at drug stores) or Sony or Bose noise-canceling headphones. Consult your doctor about sleeping pills. On long flights they can keep you asleep for up to 8 hours—essential if you are flying San Francisco-Munich-Delhi, or San Francisco-Seattle-Copenhagen-Stockholm, which I often do. But this plan works if you are flying from Sydney to Los Angeles, or from Jaipur back to California. Dine lightly before departure. Carry with you a sliced apple, unsalted almonds, a Vosges chocolate bar, dried apricots or other treats. You will not be eating on the plane, except your healthy snacks, and a light fruit and protein breakfast just before arrival on an overnight flight. Your goal is to be wrapped up, comfortable, and ready to sleep by the time the plane reaches cruising altitude. Quietly prepare for sleep. Put on your headphones or put in your earplugs. You will not watch any videos. A flight is for sleeping—and should not be wasted on B-grade movies. Quietly, deliberately and calmly put on your amenity kit socks, gather your pillows, and prepare for sleeping. Wrap yourself up in your blanket as well as your cashmere throw, covering your ankles and neck in particular. If you’re cold, it’s hard to sleep. Be sure your fastened seatbelt is visible outside the blanket so that flight attendants know you are buckled up. As you reach cruising altitude, sip a glass of water and take a sleeping pill for the appropriate duration of flight. Read for a few moments. Sleeping pills may take up to half an hour to have an effect. Slip your pillow behind your head, and adjust your seat to the best sleeping position. Get into a comfortable position. Slip on your eye mask. If you should wake, request a glass of water, do some quiet foot flexes and shoulder rotations to relax, adjust your blanket, and go back to sleep. On an overnight flight, enjoy a light fruit and protein breakfast an hour before arrival. Land fresh and ready to go. At your hotel, take a shower, and order a healthy and light breakfast or lunch, with bottled water. If you’ve followed my plan you will feel alert, energized, and ready to walk to the Tate Modern or head for Copacabana Beach. Spend the day meeting your friends, getting a sense of place. Walk in the sun, breath the fresh air. You will have an early night. Prepare for bed around 8.30pm. Take a sleeping pill and be in bed by 9pm. Put in your earplugs (unfamiliar sounds will keep you awake), read for a few moments, and plan to sleep until 7 or 8am. No jet lag. Your body will adjust quickly to the time zone and you’ll feel energetic, and excited to be in your destination. Repeat the same plan on the way home. 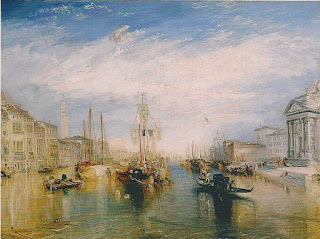 Painting of the Grand Canal, Venice, by J.M.W. Turner (1775-1851), from the collection of the Metropolitan Museum of Art, New York. I felt sleepy already reading your post, so calming and comforting. One thing I add to the routine, same as mine (a part of one meal and a glass of wine) is to set, immediately after boarding, my watch to the destination time and never try to figure what time it would be at home. It does help. Everyone has a way of flying, incidental or planned. I follow this plan posted above, beginning when I am packing. I make sure to have a fresh pillowcase on my pillow for the flight. I shake out and roll up the cashmere throw. Williams Sonoma Home cashmere throws are offered in a great selection of colors--and the WSH fringed cashmere throw (which you can have monogrammed) rolls up into a very transportable 'blanket'. I use my own pillow and blanket, even in biz class or F.
And I have friends who love to get on the plane, sip Champagne, dine for hours, and watch movies, drink more wine, snooze for an hour or two. I salute them. I've worked out my 'survival' plan on flights from SFO-FRA-DEL (about 24 hours door to door). I slept most of the way. I then flew on to Jaipur, checked in at the Rambagh, and am ready to go.Same from SFO-Copenhagen- Stockholm. Sleep, rest, read, sleep--and arrive at the Grand Hotel in Stockholm, and head straight out to the archipelago for lunch on Vaxholm, or a drive to see the Haga Pavilion. My idea of heaven. Diane, I love this post and absolutely agree with your travel advice. Once I stopped watching countless movies on long-haul flights and started sleeping instead (and restricting my eating), I felt soo much better on landing! My jet lag nearly disappeared. I flew from LA-London-Delhi last year and even after all those endless hours, I was really no worse for the wear. PS -- I stayed at the Rambagh Palace as well...lovely place. I am honored you are visiting my blog! I've been following your brilliant blog for some time--and you really grabbed my attention when you went to London, planned your son's days superbly and with great inventiveness, and then introduced your readers to Persephone Books! I ordered dozens--some just for the cover I have to admit, and all of them so individual and non-commercial and a slice of life. I've also dived into "Lucia'...and they are charming and escapist, indeed. Your book taste and enthusiasm are very Anglophile-my taste, precisely. I hope you subscribe to the Hatchard's catalog, and especially that you get updates, through email, of signed books (Debo!) and new books. They will air freight books, which fulfills the endless desire for new books. Keep on listing great books: you have such a sense of adventure and originality. Travel: you are right that 'surviving flight' means re-thinking the concept. It especially means doing your own thing--and not doing what the airline has planned (hours of eating bad food, hours of drinking, lights full on, all those videos,) a certain way to be dead on arrival. Taking control, ensuring your own comfort and travel health--essential. So happy you are adding me to your blog roll. You will go on mine in next few days! Bravo. Oh, Diane...thank you! Regarding Hatchards, it's so nice to be able to talk about it with someone who loves it as well. I always stop there immediately upon landing in London and grab a stack of books, and I peruse their online catalog to get inspired. Did you read "The Bolter"? I bought it there in March, but it's out in the US now -- it's a bio of scandalous Lady Idina Sackville. You would love it. It's so nice to "meet" a kindred soul...England and India are two of my passions, and I can see they are for you as well! I just acquired THE BOLTER! We are on the same page. I am reading it next...while I am in an 'English Aristocracy gone wild' frame of mine from reading 'Diana Mosley'. I note Idina's photos--she is no great beauty--and I hope to find out the secret of her serial affairs, flightiness, and unquenchable desire for adventure. I've also got, in the wings, All Passion Spent...I think I have you to thank for that. Oh, and two other MITFORD fans in LA are NICK HARVILL who I am sure you know, as well as PRISCILLA, a manager at Hollyhock, a rabid Mitford follower.